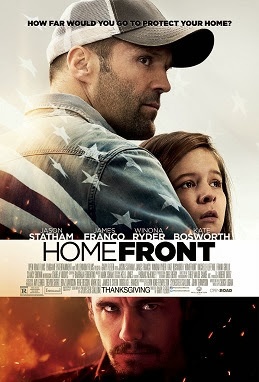 Homefront is another solid action packed Jason Statham vehicle bolstered by solid acting from James Franco and Kate Bosworth. 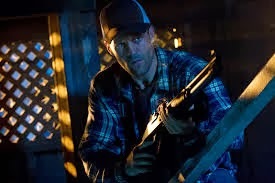 In this movie, Jason Statham plays an ex-undercover DEA agent Phil Broker looking to put his past behind him with his daughter in a small town in Louisiana. 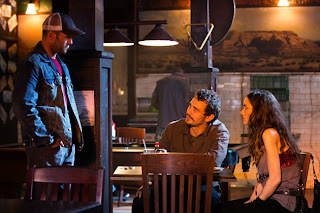 His past quickly catches up to him when the local drug dealer Gator Bodine (James Franco) takes an interest to him as a result of an altercation between Gator's sister and her family and Phil and his daughter. Yes, we've seen Jason Statham in dozens of these action movies just like Jean Claude Van Damme and Steven Seagal used to churn them out in the 1980s and 1990s. But unlike them, Jason actually has talent and has been improving over the course of his career. Pairing up with a great cast like Franco, Ryder and Bosworth certainly helps of course. Of the four, I am really impressed with Kate Bosworth's performance as the junkie sister of Gator that prompted the "family feud" with Phil. The way she physically looked for the part as well as her movements to simulate a foul mouthed junkie was really impressive. She'll have you feeling disgusted, sorry, and rooting for her character. The story itself is a bit implausible as anything that could go wrong of course does for Phil and his daughter. The role of the two thugs that attack Phil at the gas station and again at the boat house seems to be an odd thrown in that has nothing to do with the overall plot. The long hair that Jason sports in the beginning as a biker will have you giggling. Some scenes play out like an episode of Sons of Anarchy but where the bikers actually loses their gun battle. Overall, I would recommend this film. It's an improvement over Statham's last movie Hummingbird (Redemption). If you're a fan of Jason Statham's movies you won't be disappointed. It's a solid outing consistent with a lot of his movies. Franco who seems to have a monopoly on seedy characters is great as the antagonist. Also notable is Izabela Vidovic as Phil's daughter Maddy, especially in the beginning in watching her stand up to the bully. For the action fans, there are plenty of both martial arts/fist fights as well as guns blazing that will satisfy any action fan.